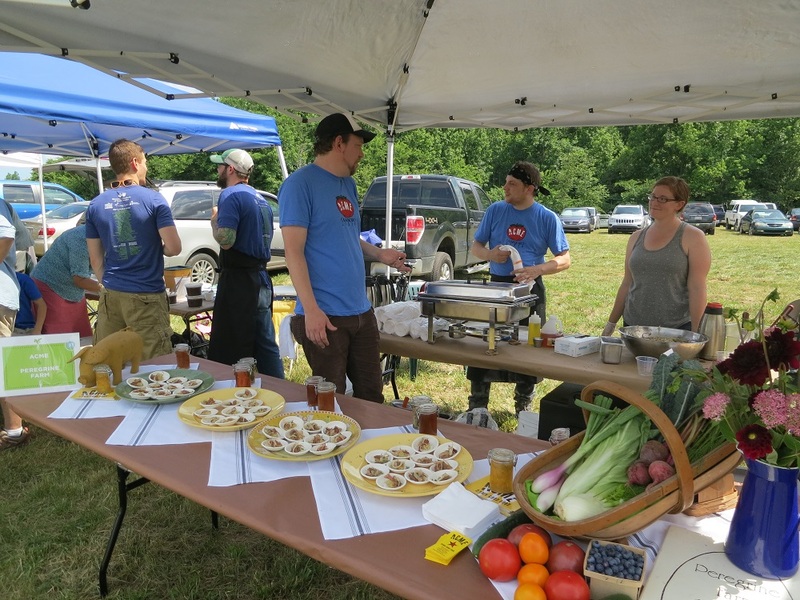 The Farm to Fork weekend was a great success. Long and tiring for those of us who help to put it on but all three events turned out really well and it seems as if all the participants had a good time. We did not attend Friday night’s dinner at Duke Gardens but all reports were that the food from the five chefs was all fabulous and rumor is our blueberries were in the desert! Saturday was a long day with market and then the Sustainable Ag. Lecture at the new Rickhouse event space in Durham. Beautiful space, great talk from Paul Greenberg about the state of the fishing industry and local fish, I need to fine time to read his book. Sunday could not have been a more beautiful day for the Picnic and it went off without a hitch. Of course it was impossible to get around to sample all the dishes but everything we had was tasty. We had a great time with our friends from ACME restaurant and our Trotter Shotters were a bit hit. Corned pig trotters over a smoked green onion grits soufflé with a fennel and torpedo onion salad on top. By the end of the weekend we were ready for a rest! The flower department is full speed ahead. The Gloriosa Daisies and the Zinnias have finally decided to bloom. Annabelle Hydrangeas. The tall and stately Safflower. Dianthus in dayglo colors. Sunflowers. Yellow and blue Statice good fresh or to dry. Of course lovely mixed bouquets. Blueberries still but nearing the end our crop. The Tomatoes are here! starting with Big Beefs in red, Cherokee Purples and a few Orange Blossoms. Lots of great Fennel. Nice heat tolerant lettuces- Red and Green Summer Crisp, Little Gem and a bit of Oakleaf too. The last of the Escarole for soups and salads. The Radicchios with round red and the tall green Sugarloaf, great for grilling. Still beautiful Lacinato Kale. Basil and Italian Parsley. More Cucumbers. In the roots department Red Radishes and lots of Beets in all three colors, Red, Gold and the striped Chioggia. Carrots too. Fresh Long Red of Tropea (Torpedo) Onions, also great for grilling.